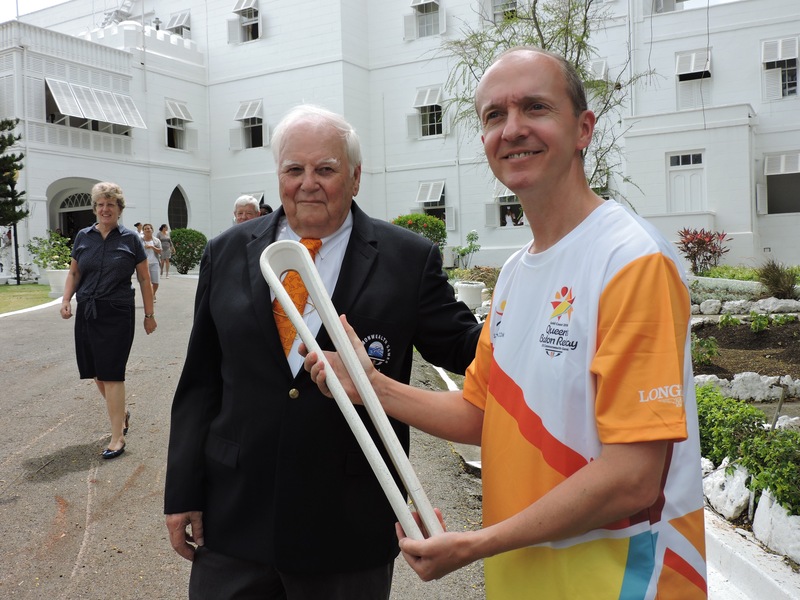 Commonwealth Games Queen’s Baton Relay Arrives in Barbados – Barbados Olympic Association Inc. 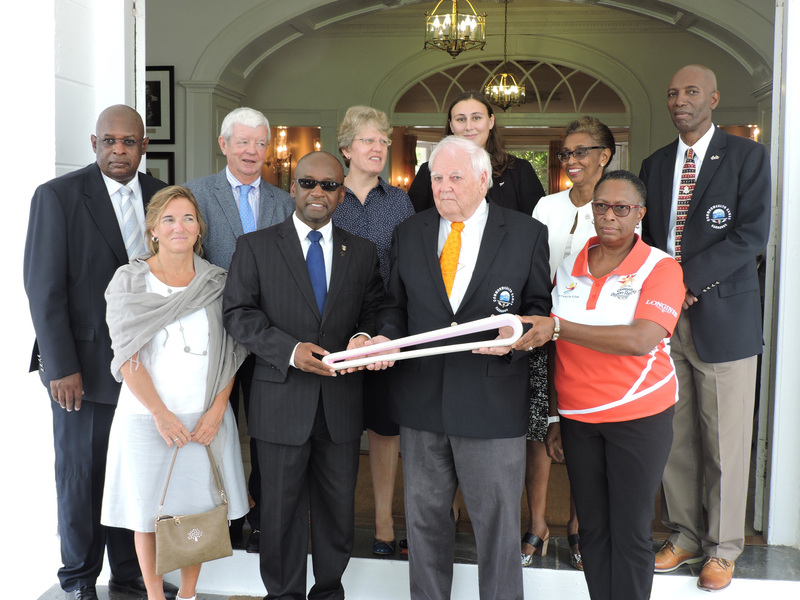 The Commonwealth Games’ Queen’s Baton Relay arrived in Barbados on Saturday from St. Lucia. The baton which will eventually touch every Commonwealth territory was met by President of the Barbados Olympic Association Inc. (BOA), Mr. Steve Stoute, Secretary General, Mr. Erskine Simmons, Assistant Secretary General, Mr. Cameron Burke, Chef de Mission to the Commonwealth Youth Games in the Bahamas, Mrs. Gail Craig-Archer and Commonwealth Games Ambassador and BOA Board Member, Sandra Osbourne. Mr Stoute and Mrs. Osbourne received the baton from its guardians and presented it to junior Commonwealth Games gold medalist, Rivaldo Leacock to symbolise the start of Barbados leg, of the Queen’s Baton Relay which will cover 70 countries and territories. Barbados is its 24th stop. Stoute said that he was pleased to welcome yet another baton to the island. “The baton represents the coming together of people of different nations in peaceful, wholesome activity. Whether we are small islands or a continent, this symbol is a call-to-action to unite as one people. It is a privilege to host the baton, and I hope that Barbadians would capitalise on this unique opportunity to see the baton over the next few days,” Stoute said. The baton relay started on March 13, 2017, at Buckingham Palace and will travel on an epic 388-day journey through all nations and territories of the Commonwealth. In Barbados, it will start its official journey from the Governor General’s residence for a 10k road relay that will see representatives of National Federations, schools and prominent sports personalities pass the baton through the districts of the Pine, Government Hill, Ivy, My Lord’s Hill, Welches, Collymore Rock and Wildey all the way to the finish at the BOA headquarters. It will again be on display at the Flow Sheraton Centre store in the evening from 4 pm – 6 pm. On Tuesday, it will be taken on an island tour where it will be photographed at several historical and local points of interest. The baton leaves Barbados on Wednesday for Dominica. The Queen’s Baton will arrive on the Gold Coast for the XXI Commonwealth Games Opening Ceremony on April 4, 2018, where Her Majesty, or a representative, will remove the message from the Baton and read it aloud to officially open the Games.